What's an intrepid adventure traveler to do when they've already visited all seven continents, climbed Kilimanjaro, hiked the Inca Trail, and sailed the Galapagos Islands? Why, visit the North Pole of course! Not many people realize that it is actually possible to make the journey to the very top of the world, but for those who are adventurous enough – and have plenty of cash – it is a once in a lifetime opportunity to visit a place that few other people ever get to see. It isn't easy of course, but the end result is an exciting adventure to one of the most remote places on the planet. A place that is quickly being altered by the effects of climate change. So how exactly does one get to the North Pole? Some people will sail there aboard ships specifically designed to cut through the crushing ice found in the Arctic Ocean. Others will go through a place called the Barneo Ice Camp, which is a temporary base built by a team of Russian engineers each spring just one degree of latitude from the Pole. That camp includes a landing strip for aircraft and a small tent settlement where visitors stay while making their way to and from the Pole by helicopter. Both routes offer access to 90ºN, with various tour operators and guide services taking clients on epic adventures to a place seldom visited by man. Interested in making the journey yourself? Here are a few examples of trips that can take you there. Want to visit the top of the world in as short of a timespan as possible? Then this is the trip for you. Hosted by Quark Expeditions, a company that specializes in polar travel, this three-day trip departs from Longyearbyen, Svalbard in Norway with a flight directly to the Barneo Ice Camp. Want to try something really adventurous? If skiing the last degree to the Pole isn't adventurous enough, there is one last option. 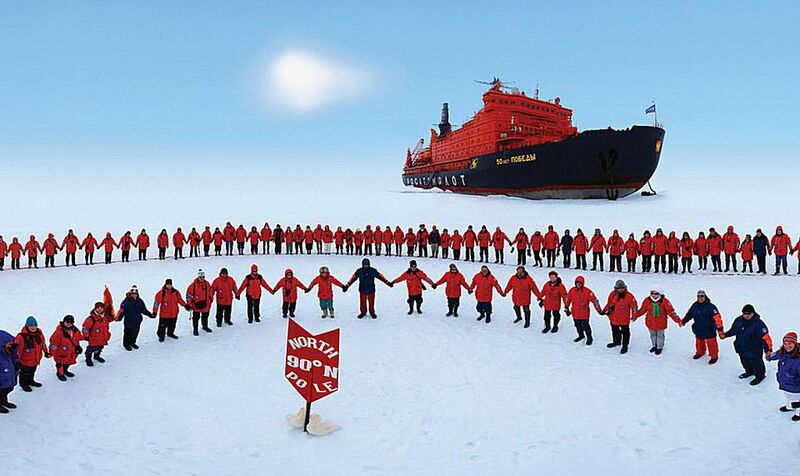 Adventure Consultants also offers a trip called North Pole - All The Way, which is actually 60 day journey that covers the full distance across the Arctic starting at Ward Hunt Island and ending at 90ºN. Travelers will then depart via helicopter to Barneo Ice Camp before heading home via Longyearbyen in Norway. This is one of the toughest, most adventurous trips on the planet, and not to be taken lightly. But, for those who do embark on it, legendary status awaits. Price: Contact the Adventure Consultants to find out. These are the most common ways to travel to the North Pole. There are other travel companies that can facilitate similar experiences, but these trips will give you a taste of what is available provided you have a spirit for adventure and a deep wallet. What Is There to Explore in the Arctic Circle?